The massive and rapid expansion of e-commerce has caused the retail market to change in a number of ways. There is a common perception that consumers prefer e-commerce because they do not want to leave the comfort of their homes. Others believe that e-commerce spells the end for the brick and mortar retail market as we know it today. Both of these are, however, quite far from the truth. E-commerce has caused the retail market to grow itself, as well as encourage the retail market to change and modernize its practices. Below are six ways in which e-commerce has caused the retail market to change. As consumers become accustomed to purchasing all of their goods online, e-commerce retailers have shifted the majority of their marketing to online platforms. As a result, many brick and mortar retailers are relying on online marketing engagement in order to compete. Because consumers frequently shop online, they rely more on digital marketing. 44% of consumers report that their behavior while shopping online changes when they receive promotional offers. Digital ads are also often shared, with over 17% of millennial women sharing marketing ads and over 10% of millennial men sharing ads. Millennials are currently the largest consumer population that is the most likely to share an advertisement. E-commerce uses this knowledge frequently when targeting advertisements at millennial consumers. Additionally, these advertisements have an effect on consumer purchasing. Reading comments and reviews on social media influence 45% of consumers when they make a purchasing decision. One way that brick and mortar retailers fail to deliver for modern consumers is by providing digital coupons. 42% of consumers want to be able to automatically use discounts and coupons during a purchasing experience; however, only 16% of brick and mortar retailers provide consumers with the ability to credit discounts and coupons automatically. E-commerce giants frequently offer discounts and savings at check-out. In order to meet consumer expectations, the retail market is slowly offering instant coupons upon checkout. More successful retailers are often advertising these coupons on social media. There are reports that brick and mortar stores are struggling under the weight of e-commerce growth. However, retail employment is growing. Between 2002 and 2016, over 645,000 net jobs were added to the retail industry. A major area of growth in the retail market has been in marketing. E-commerce thrives on its marketing efforts, so retailers have been growing their own marketing departments in order to compete. Since marketing has become an integral part of the retail market, more retail stores are hiring marketing professionals. Brick and mortar retailers should invest in a marketing team of social media experts in order to meet consumer expectations. While many new positions in the retail industry have been in marketing, sales continue to be a growing position. More than eight-in-ten American consumers report that they want to be able to ask a sales clerk questions about the product that they are buying, particularly when buying something for the first time. Retailers that phase out sales clerks altogether will not be meeting consumer needs or expectations. By providing consumers with a sales clerk who has a specialized skillset, the consumer will be able to make a more informed purchase. Retail specialization and innovation are being driven by automation. E-commerce companies employ an average of four or fewer employees, since e-commerce tends to require fewer staff than brick and mortar retailers. E-commerce warehouses are largely automated. Brick and mortar retailers will be affected by automation in the future. One estimate states that automation could impact between 30% and 50% of global retail positions. Features such as self-checkout stations and self-sorting warehouses could impact the number of retail employees that are hired moving forward. However, automation will not ruin retail. Many brick and mortar retailers can offer specialty support staff that do not exist online. For example, clothes retailers that employ fashion consultants offer a unique experience that Amazon and Walmart’s online stores cannot provide. Successful retailers are establishing themselves as a specialty shopping experience that cannot be found online. Specialization will continue to grow in the retail market as brick and mortar retailers shift their focus under the growth of e-commerce. Approximately eight-in-ten Americans shop online. This statistic is frequently cited as a sign that the brick and mortar retail market is no longer able to compete with e-commerce. However, not all online shoppers demonstrate the same behavior. Only 15% of these consumers shop online on a weekly basis. The majority of online shoppers – 37% of them – make online purchases approximately only once a month. While most Americans are online shoppers, the majority are not shopping online on a frequent basis. 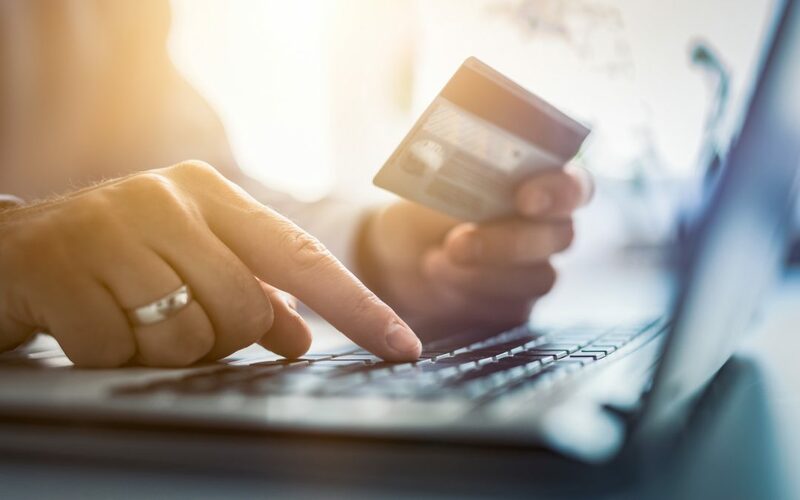 Consumers do not turn to online shopping simply because it is more convenient than visiting a brick and mortar retailer; rather, consumer behaviors have changed due to the larger range of options that online shopping affords them. Consumers turn to online shopping because they want the best price for their wallet: 65% of American consumers use price to determine whether they will buy something online versus in a store. Additionally, Americans want to be able to make a purchase easily. More than half of Americans use their cellphone to make an online purchase. Consumers are using their cell phone to compare prices and find optimal deals. E-commerce’s online presence has caused the retail market to need to invest in high quality mobile websites. Retailers that invest in functional and easy-to-navigate mobile websites will be able to accommodate changing consumer habits. E-commerce uses data collection to better understand its consumer population. Understanding consumers will help retailers carry the most desired products. E-commerce giants track their consumers’ spending habits in order to provide the best possible shopping experience. Smaller retailers can utilize data as well, since data collection has proven to be a tool used in retailer growth. However, transparency with data collection is vital. In a survey on retail data collection, 60% of respondents did not feel comfortable having their data shared or sold. However, many consumers recognize that data collection is a common practice. 64% of consumers feel that data collection should be an opt-in program. Additionally, if a retailer is going to collect data from a consumer, six-in-ten consumers feel that they should be given discounts as compensation. Since e-commerce giants thrive on data collection, the retail market has invested in the technology in order to stay competitive. Retailers that offer opt-in data collection programs have a better relationship with their consumers. While e-commerce has changed many aspects of consumer behavior and the retail market, some behaviors will never change. 64% of Americans prefer shopping in a physical store over an online store. While online shopping may provide different options for a consumer, ultimately e-commerce has not changed the American consumers’ desire to physically engage with a product. Consumers still prefer a tactile shopping experience. 42% of consumers want to pick out a product in person, citing the desire to see its dimensions up close. Additionally, while Amazon is seeing exponential growth, online purchases are not dominating the retail market. In 2015, roughly 10% of all retail purchases were made online, showing that brick and mortar retailers still hold the majority of the retail market. It is important to note that brick and mortar retailers are not competing with multiple e-commerce competitors; rather, Amazon itself is the only major e-commerce retailer that is closing in on the online retail market. Of all e-commerce purchases, 43% of them were purchased through Amazon. Amazon holds almost half of all online purchases. While the retail market has certainly changed due to the e-commerce boom, this change is largely due to Amazon. Because the retail market is primarily only competing with one major e-commerce business, the retail market will continue to thrive. Ultimately, while e-commerce is encouraging changes to the retail market, brick and mortar retail is also experiencing growth. E-commerce has shifted marketing efforts to exist largely online, with social media influencing many purchasing decisions. Despite e-commerce’s growth, retail employment is growing, particularly in the marketing sector. Automation will continue to change retail employment; however, brick and mortar retailers are able to specialize their services in a way that e-commerce cannot. E-commerce has adjusted consumer habits, but consumers continue to prefer shopping in physical stores as opposed to shopping online. While online shopping is more common overall, the majority of consumers are not frequent online shoppers. Retailers that are transparent with their opt-in data collection programs are able to better understand their consumers while also improving transparency with loyal customers. E-commerce is not making brick and mortar retailers obsolete: consumers still prefer shopping in store as opposed to online, and e-commerce retail’s growth is largely due to amazon. E-commerce – and particularly Amazon – will continue to change the retail market, but brick and mortar retail remains strong and steadfast.